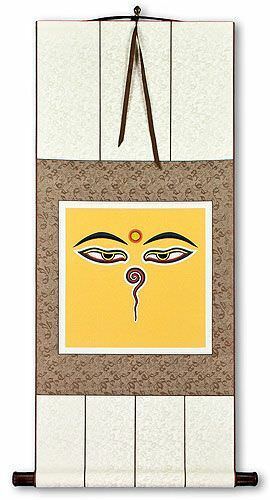 Buy a Buddha Eyes calligraphy wall scroll here! Not the results for buddha eyes that you were looking for? Wonderful sound. (1) Gadgadasvara, 妙音菩薩 (or 妙音大士) a Bodhisattva, master of seventeen degrees of samādhi, residing in Vairocanaraśmi-pratimaṇḍita, whose name heads chap. 24 of the Lotus Sutra. (2) Sughoṣa, a sister of Guanyin; also a Buddha like Varuṇa controlling the waters 水天德佛, the 743rd Buddha of the present kalpa. (3) Ghoṣa, 瞿沙 an arhat, famous for exegesis, who "restored the eyesight of Dharmavivardhana by washing his eyes with the tears of people who were moved by his eloquence." Eitel. (1) śārī, śārikā; a bird able to talk, intp. variously, but, M. W. says the mynah. Śārikā was the name of Śāriputra's mother, because her eyes were bright and clever like those of a mynah; there are other interpretation (2) śarīra(m). 設利羅 (or 室利羅); 實利; 攝 M004215 藍 Relics or ashes left after the cremation of a buddha or saint; placed in stupas and worhipped. The white represent bones; the black, hair; and the red, flesh. 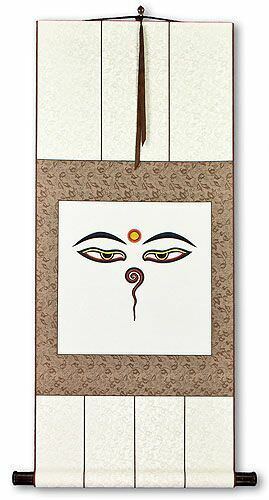 Also called dhātu-śarīra or dharma-śarīra. The body, a dead body. The body looked upon as dead by reason of obedience to the discipline, meditation, and wisdom. The Lotus Sutra and other sutras are counted as relics, Śākyamuni's relics are said to have amounted to 八斛四斗 84 pecks, for which Aśoka is reputed to have built in one day 84,000 stupas; but other figures are also given. śarīra is also intp. by grains of rice, etc., and by rice as food. 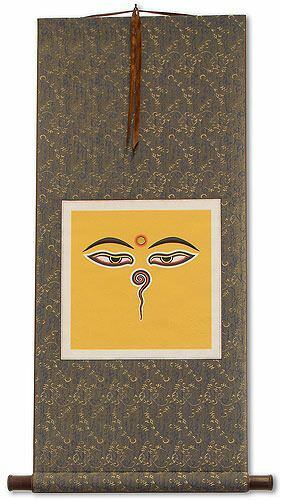 The Eye of the world, the eye that sees for all men, i. e. the Buddha, who is also the one that opens the eyes of men. Worldly, or ordinary eyes. Also 世眼. Some people may refer to this entry as Buddha Eyes Kanji, Buddha Eyes Characters, Buddha Eyes in Mandarin Chinese, Buddha Eyes Characters, Buddha Eyes in Chinese Writing, Buddha Eyes in Japanese Writing, Buddha Eyes in Asian Writing, Buddha Eyes Ideograms, Chinese Buddha Eyes symbols, Buddha Eyes Hieroglyphics, Buddha Eyes Glyphs, Buddha Eyes in Chinese Letters, Buddha Eyes Hanzi, Buddha Eyes in Japanese Kanji, Buddha Eyes Pictograms, Buddha Eyes in the Chinese Written-Language, or Buddha Eyes in the Japanese Written-Language. 2 people have searched for Buddha Eyes in Chinese or Japanese in the past year.